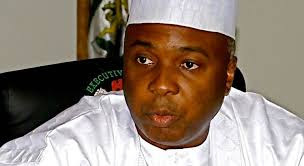 There were fireworks in Senate President Bukola Saraki's fraud trial at the Code of Conduct Tribunal, CCT, on Tuesday according to a report from The News. Chairman of the Tribunal, Mr. Danladi Umar had to ask the defence counsels, led by Mr. Kanu Agabi (SAN) to be more tidy in the cross examination of the witness, Micheal Wetkas, the report said. "The defence has been cross examining the witness for four weeks now. But this did not stop the defence from continuing with the long drawn cross examination, an action which forced Jacobs to stand up to interrupt the proceedings many times," the report said. When Paul Usoro, SAN who was doing the cross examination was going on dwelling on the description of the houses, Jacob intervened arguing that Usoro have already spent two days on this description. “He is over burdening the witness. I will call a witness who know about it to come and give evidence,” Jacobs objected. However, Usoro said his cross examination was to show that the No 15 McDonald which the prosecution claimed is one property is actually four different buildings. According to him, there was no 15A and 15b McDonald, Ikoyi bought by the defendant in year 2000, different from No 15 and Block 15 flats 1-4 which were sold by FG in 2006. Rotimi however replied that if there is any confusion, it was caused by Saraki himself who described it in various ways in his Assets Declaration Form.